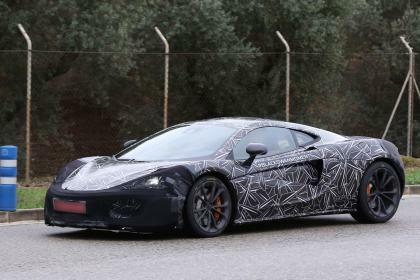 McLaren has only just taken the wraps off the first model in its new Sports Series, the 570S, yet plans are already well underway to grow the range to three body styles. This time next year, a 570S GT will arrive with a fastback-style rear end in place of the exposed engine cover and concave rear screen of the 570S Coupe. The more flowing rear end can clearly be seen on the disguised car in our spy shots and it could even add a degree more practicality if McLaren sees fit to allow extra luggage to be stowed above the mid-mounted rear engine. It’s expected that the GT model will only be available with the larger 562bhp engine, as eventually will a long-tail LT version of the 570S coupé – along similar lines to the 675 LT.
Once the coupe and GT models are established, the 570S Spider will arrive – some time in 2017 – with a similar folding hard top to its bigger brother, the 650S Spider. Before any of the new bodystyles turn up, a cheaper, less powerful Sports Series model will be unveiled at the Shanghai Motor Show later this month. The 540C will come with a 533bhp version of McLaren’s V8 engine and do without the carbon ceramic brakes and leather interior of the more expensive model.